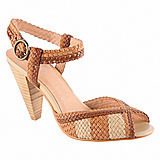 In search of my summer shoe for this year, I came across the Mcglaun sandal from Aldo. I liked the look of this sandal and really wanted it to be comfortable. Unfortunately it wasn't. First, it fits small. The length of the size 39 sole was good but the toe box was so tight my little toe could just barely get squished in and it pinched before I even stood up. I did try a larger size but the comfort just wasn't there. I found the material uncomfortable, some of the stitching was rough and the straps holding the ankle band were very uncomfortable. So, my summer shoe search continues. Sadly, that is what I'm starting to find as well as of late. What is your safe go-to brand of choice?